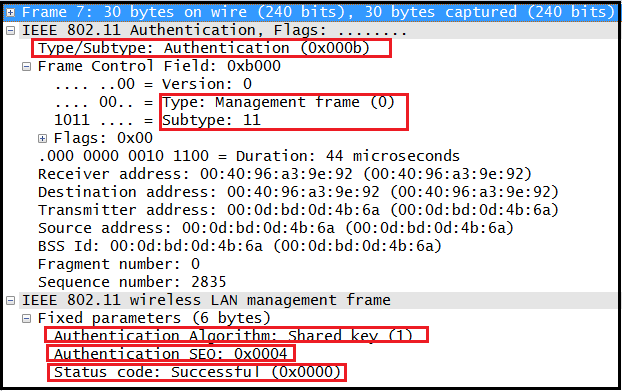 The initial purpose of the authentication frame is to validate the device type (verify that the requesting station has proper 802.11 capability to join the cell). This exchanged is based on simple two-frame (Auth Request & Auth Response) called Open System. Here is the 2nd Auth Frame (Auth Response) of the Open System frame exchange. 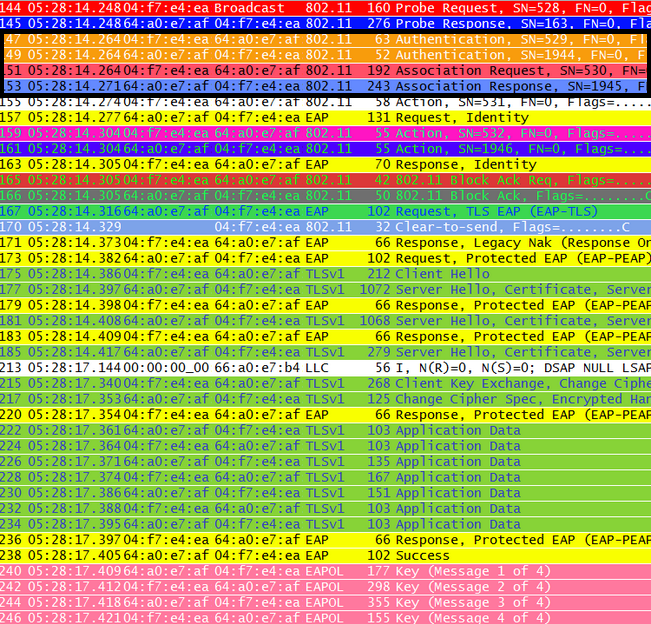 As you can see here, Auth Seq Number is 2 indicating this is Auth Response frame. Also status code is 0 indicating successful Open System Authentication. 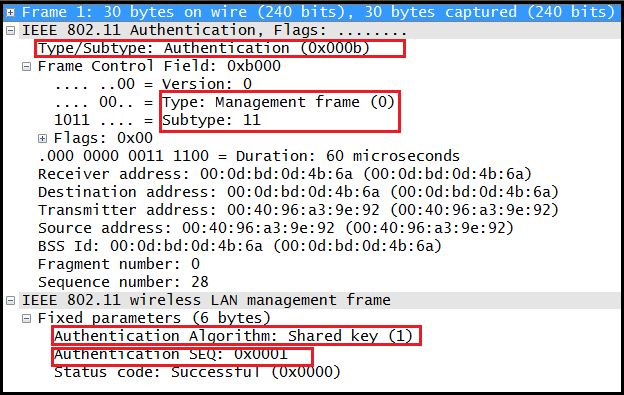 Even in a 802.1X/EAP Authentication, Always Open System Authentication occur first & then followed by EAP Authentication & 4 Way handshake prior to encrypt data. Here is 802.11r FT Association where 802.1X frame exchange after the Open System Authentication & Association completes. If it is a Shared Key authentication, there will be 4 authentication frame exchanged as shown below. Here is the 2nd Auth Frame (Auth Seq No=2) . Note that this frame contain a “Challenge Text”. 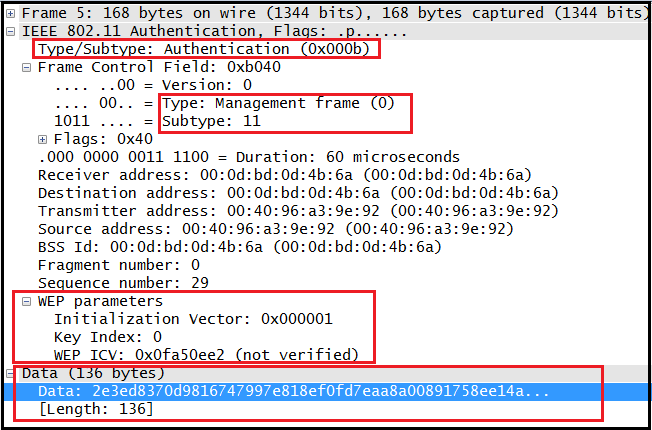 It is expected receiving device of this frame encrypt it using WEP & send it inside Auth frame 3. Here is the 3rd Auth Frame in that exchange. 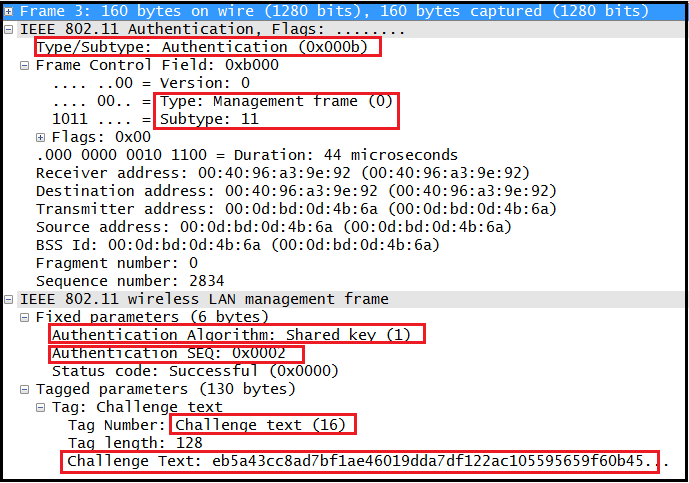 You can see WEP encryption used Here is the last frame (Auth Seq No =4) of Shared Key Authentication. Note that Status code=0 indicate Successful Authentication. 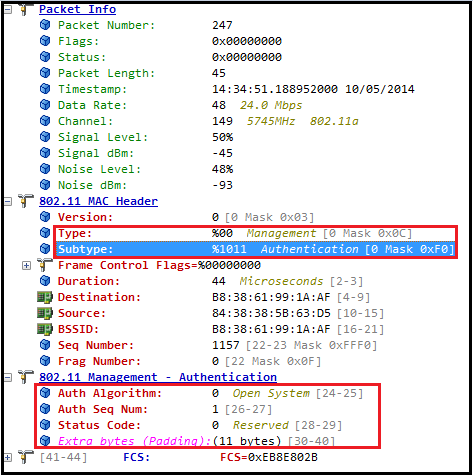 Good work with the WLAN packet explanation. I follow your blog religiously. I am not sure if you have used another visual tool wizshark (https://www.wizshark.net). You may want to give it a try and i would love to hear your feedback. Drop me an email and i will set you up for a beta account. I havn’t use that tool & greatly appreciate if you can setup a beta account for me. Would love to use that & give you feedback. Nice. Please send the request to me (bmisra at airtightnetworks.com). I will have it setup. 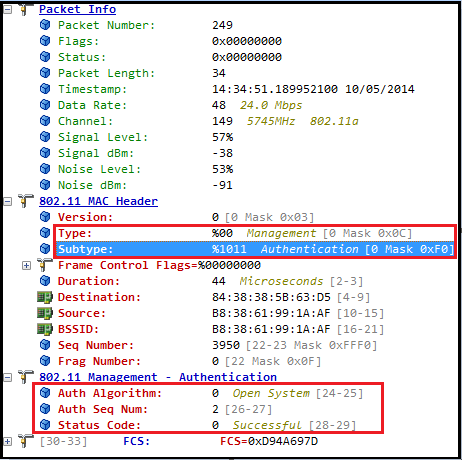 How done AP know the 11n capabilities with authentication frame exchange? Which tool is used in this explanation ? is it available for linux?